Sadhana is a Rehabilitation Council of India certified Audiologist and Speech Language Pathologist. She is currently based in Chennai. She is experienced working as a Senior Speech Language Pathologist in Transdisciplinary neurodevelopmental setups plus outpatient clinics. 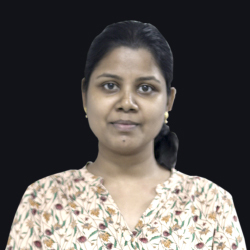 She had exposure as an SLP and Audiologist in various Medical hospitals, special schools, clinical setups, NGOs and Speech and Hearing Educational institutes in South India. She was also involved in Telepractice of speech language pathology services during her educational program and she continues to provide teletherapy services in her professional career as well. She is a CITI Research Program Certified candidate. She facilitates clinical practitioner - researcher collaboration and is actively involved in research activities. She has presented papers and posters on evidence-based assessment and treatment of various communication disorders. She is experienced in providing clinical and academic training and education to allied healthcare professionals thereby expanding her service delivery.